Route 10 crosses this creek near the Hopewell-Prince George County line. 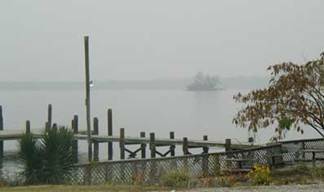 · Bayley’s/Bailies Creek forms the dividing line between Prince George County and the present city of Hopewell and is crossed by two state routes – 10 and 156. · Located somewhere along the tributary, Easterly Run (later known as Manchester Creek), was the first of 2 mills owned by Lewis Green , II. Next stop is Jordan’s Point, pronounced jer·den. Turn left off route 10 onto Jordan Point Road (route 156). · This road runs parallel to the James River . · Somewhere in this vicinity is where the very first William Green survived the Great Massacre of 1622[i]. Our third stop is Merchants Hope Church. To get to our next stop we need to back track to route 10. From there turn left back onto route 10. Turn off route 10 onto Merchants Hope Road (route 141). Merchants Hope Church is located on the right. · The church was built in 1657. · It was here that 10 Oct 1660, that the first Lewis Green was awarded 100 lbs tobacco for a wolf head[ii]. 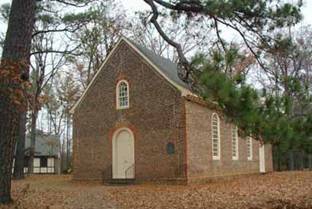 · It appears from various court records that the church also was used at times as a meeting place for the Court. Continue on Merchants Hope Road (route 141). Turn right off route 141 onto Ruffin Road (route 156). Turn left off route 156 onto Sandy Ridge Road . · Along this road is the area known as High Peake. Lewis Green II purchased 203 acres of land here in April of 1702[iii]. · Bayley’s/Bailies Creek forms the dividing line between Prince George County and the present city of Hopewell and is crossed by two state routes – 10 and 156. South of where Rt. 156 crosses Bailey’s Creek, the land rises sharply and a portion of that land, along Sandy Ridge Road , is still known as “ high point acres”[iv]. · The highest point in this area is near the intersection of route 141 and route 646. From Sandy Ridge Road turn right onto Prince George Drive . · Shortly after making the turn we cross Bayley’s Creek for a second time – as stated before it is somewhere along this creek is the location of the tributary, Easterly Run (later known as Manchester Creek), where the first of two mills owned by Lewis Green II was located. · Near this is the area that was known as Fog Bottom, the early location of the Prince George courthouse. This area is now inside of the Hopewell city limits. Turn left onto Courthouse Road . Turn right onto Miles Avenue . Turn left onto River Road (the radio station WHAP 1340 AM is on the corner). · On the left hand side of the road, just before crossing the Prince George County line, we passed Crystal Lake, which is probably the place referred to on 29 Oct 1789, in deed from Francis Burwell Green of Pr. Geo. Co. to John Lewis of same, for £130, for use of Green’s fishing place, known as “John Thweatt ’s fishing at Bullhill” which said Green has lately bought from John Thweatt, for use only for hauling lines. Wit: Thomas Machen , George Wilson . Recorded 18 Jun 1790. 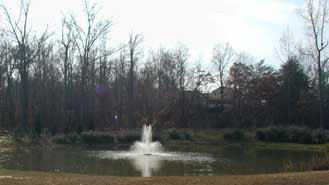 Continue on River Road , on the left you will see another portion of the land owned by Lewis Green II, known as High Peake. · The land on which the Green family resided for over 100 years is located here. 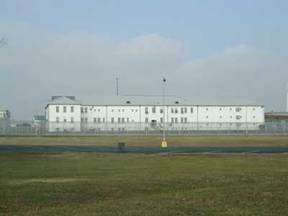 Today the Federal Correction Institution sits on the land. · Cittie Creek, which ran through the area, has become silted in over the years, and at present remains so (12/2001). 2nd Mill owned by Lewis Green II & III was located on Stoney Point at Jones Hole. 1619 – Appomattox Manor – Mary Green m. to grandson of the 1st Epes [Edward Epes ?]. The tour is noted by stars with corresponding letters on the map located on the inside cover of this volume. [i] From information compiled by Ardath Jo Green dated 9 Jan 1984. [ii] The Lewis Green Senior Family of Southside VA, notes by Emilee Mills Staubach, Houston, Texas, 1976 – these records were donated to the VA State Library by Mrs. Staubach in Dec. 1978; VA Colonial Abstracts, Beverly Fleet, Vol. XL, p. 252 Ct. Orders 658-1661. [iii] Information Concerning Lewis Green and Descendents, compiled by Ardath Jo Green , Charles A. Barker , and others, dated 22 Mar 1982. VA Notes, Vol 3, p. 15 ½, by Nimmo. [iv] Information Concerning Lewis Green and Descendents, compiled by Ardath Jo Green , Charles A. Barker , and others, dated 22 Mar 1982.